Born in the market town of Dorchester, Dorset, England, Maurice Evans was the son of a Welsh druggist and part-time justice of the peace, who also fancied himself a dramatist. Young Maurice (pronounced as Morris; different from his Bewitched namesake, Mor-EECE) began acting in his father's adaptations of Thomas Hardy's novels, making his first appearance onstage in Hardy's Under the Greenwood Tree. The boy also had a fair voice and sang in the St. Andrews choir in Stoke Newington after his family moved to London. Evans then worked in little theater before making his professional debut at Cambridge in 1926. He played Orestes in The Oresteia. But it was his performance as Lieutenant Raleigh in Journey's End that made him a London sensation. As a result, he appeared in leading roles in aproximately twenty plays between 1930 and 1934. After several other stage performances in Shakespearean roles such as Falstaff; Hamlet, and Henry IV, Evans and wartime friend George Schaefer (former associate dean of theater, film, and television at UCLA) produced The Teahouse of the August Moon in 1953. Moon starred David Wayne and was a satire about a United States Army unit trying to bring democracy to a Pacific island, which ran on Broadway for 1,027 performances and captured the Pulitzer Prize in 1954 for drama, as well as a Tony Award. While Teahouse was still thriving, Evans produced (with Evett Rogers) No Time for Sergeants, about a hillbilly draftee who nearly brings the army to its knees. It ran for two years and made a star of Andy Griffith, who went on to star in the 1958 film version and the original TV rendition; the latter of which premiered on the U.S. Steel Hour on March 15, 1955. Also in 1955, Evans established a relationship with television's Hallmark Hall of Fame, and went on to produce small-screen images of, among others, Hamlet (1953), Macbeth (1954), Richard II (1954), Dial M for Murder (1958), The Tempest (1960), and Alice in Wonderland (1954), for which he also served as narrator. "It's startling to think," he said in his very prosperous year of 1954, "that the TV audience that will see Macbeth probably will be larger than all the combined audiences who have seen the play since Shakespeare wrote it. The Evans big-screen film library includes Wedding Rehearsal (1932), Scrooge (1935), Planet of the Apes (1968), its first sequel, Beneath the Planet of the Apes (1970), and Rosemary's Baby (a film both Endora and Uncle Arthur protested on Bewitched). In addition to Sam's classy dad on Bewitched, Evans had TV spots on Batman (as the Puzzler in two episodes), I Spy, Name of the Game, The Mod Squad, and Search. After Bewitched folded in 1972, he resurfaced in 1980 for a stage tour of Holiday (Philip Barry's 1928 comedy glorifying nonconformity), and in small parts on television, including the 1980 syndicated fantasy movie-of-the-week, entitled The Girl, the Gold Watch and Everything with Pam Dawber (Merk and Mindy). 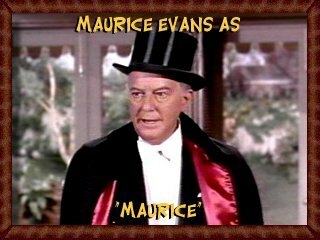 Maurice Evans passed away in Brighten, England, on March 12, 1989, at the age of eighty-seven.